Canoe touring: You don’t have to be an athlete or adrenalin junky to enjoy paddling – canoes and kayaks are fun for everyone. Kayaks and canoes allow us to explore rivers, waterways and coastlines around the UK – and with over 100 miles of waterways in London alone, there is plenty of scope for canoe touring in and around London. Free navigation of London’s canals is allowed all year providing your boat is licensed with the Canal and River Trust. See the Canal and River Trust website for more information. A licence can also be obtained via membership of the British Canoe Union (BCU), which automatically includes a Canal and River Trust permit. Most London clubs hold a BCU licence which will cover their club boats. An excellent resource is the book Pub Paddles, The best short canoe trips in the south of England, which describes 27 trips around London and includes maps, pages of details and information about local canoe hire shops. As with all kayaking and canoeing, you should not go out on the water unless you can swim, and a buoyancy aid should always be worn. If you are inexperienced, don’t paddle alone, but team up with friends or join a local club. If venturing onto fast rivers, estuaries or the sea, experienced paddlers know to travel in a group of at least three boats, so that they can help each other if the need arises. Kayakers and canoeists should not assume they have a right to access rivers across England and Wales – as rivers can be ‘owned’ by landowners who may object to your presence. Such restricted access is almost unheard of in other countries where there is an assumed public right of access, as there is in Scotland. For more information on access see our River Access page. 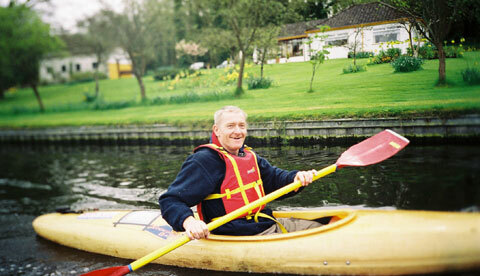 Many London clubs will offer opportunities for recreational kayaking and canoe touring.